Dig a hole 4m wide near your house till you reach the water level. Go one more metre deep and put a layer of charcoal which acts as a strainer. If required, use an iron sheet all around to keep the pit from collapsing. Remove the sheet after you put charcoal and one and half metres of river sand. Insert two 2-inch PVC pipes, perforated at the lower ends, and 25 cm apart. Cover the perforated ends with net to prevent stones and other particles from coming up. Connect one pipe to the roof. A strainer at the top will keep leaves and other wastes from going down along with the rainwater. Insert a hose in the other pipe which has a foot valve at the bottom. Connect this pipe to an electric pump. Rainwater displaces the dense hard water underground. If water comes up to the surface, put half a metre of ordinary sand on top of river sand. This will prevent the water from overflowing. Once a week, pour bleaching powder solution through the pipe on the roof. This will keep the water pure underground. Rooftop harvesting is the best way to collect rainwater. All one needs is a roof and a sump, well or tank to store the water. For residential requirements, harvesting systems cost between Rs 5,000 and Rs 30,000 depending on the size of the premises, nature of soil and the technology involved. The best time to harvest is during intermittent rains. Harvesting cannot be done when there is a constant downpour since the soil will not absorb beyond a point. To collect rainwater in houses and apartments, direct rainwater from the terrace to the ground through drain pipes to a filter tank and open wells or to percolation or absorption pits and wells below the soil surface. These can be covered with slabs to facilitate pedestrian and vehicular movement on the ground. You can also use a percolation pit 4 to 8 m deep, depending on the nature of the soil, and 25 cm wide. It is filled with pebbles and river sand on top and a square or circular collection chamber to arrest silt at the top. Another option is an absorption well, constructed using cement rings of 2 to 6 ft diameter. 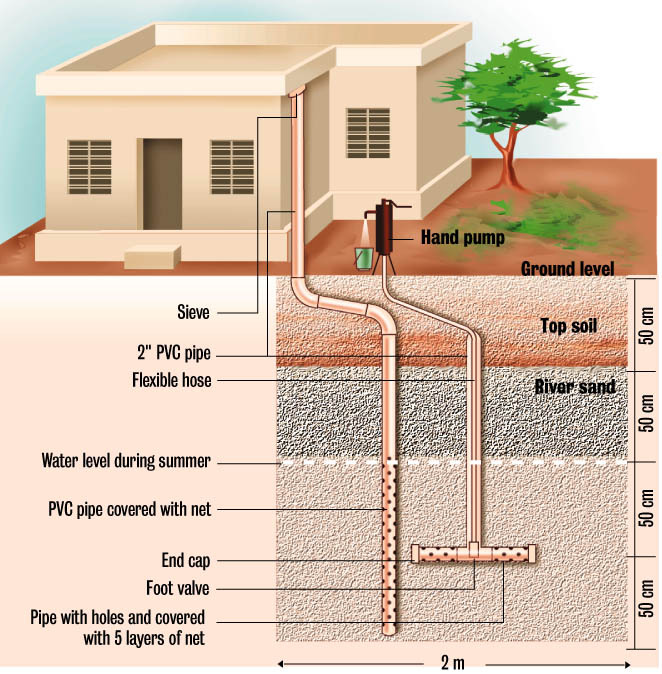 Depth depends on the nature of the soil, and the diameter depends on the number of rooftop pipes likely to be connected. In areas where the soil is clayey up to about 15 feet, go for a percolation well of 10 ft to 15 ft and a hand bore pit within this well up to a similar depth. Insert a PVC pipe of 6 inches diameter into the bore. In apartments, water falling in the open space around the complex can be collected through a gutter with a perforated lid. Lead the collected water through pipes into a recharge well 1 m wide and 5 m deep. Slope the roof to drain water towards the storage system. Keep the roof uncluttered and easy to clean. While casting the roof, place a Ôfloor trap' near the inlets of the water pipes to the ground. Roofs should have a gutter of PVC or zinc sheet to collect water and channel it to the pipe. To carry water down use 90mm diameter PVC pipes resistant to UV rays. Four pipes would be sufficient for 1,000 to 1,200 sq. ft area. Use a floor trap where the water enters the drain below or a piece of sponge at the mouth of the pipe. Filter rainwater before storage. A PVC bucket with gravel, sand and charcoal is a good filter. A PVC drum with sponge at the inlet and outlet is also a filter. Plan your storage system beforehand. It can be a roof-level storage tank, ground level drum or masonry tank, underground sump or a tank partly below ground. If water does not contain any organic material and if it is stored in a clean container it can stay for a long time. Use alum or chlorine to clean the water. Always boil and filter water used for drinking.